SELECT FROM THIS LIST B092-001 | INHALE:AIR CLEANER | Units:EACH B092-002 | INHALE:FILTER | Units:EACH B092-003 | INHALE:CHARCOAL | Units:PKG. Work areas where UV materials are handled should be thoroughly ventilated. It is important to protect the lungs from UV inks, coatings, and other hazardous chemicals. 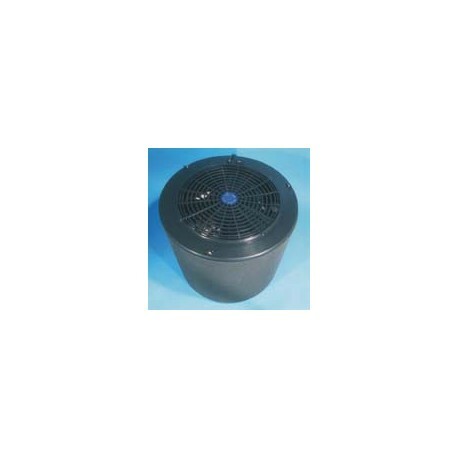 The SAF-T-CURETM PORTABLE AIR CLEANER filters the air through 340 cubic inches of activated charcoal which attracts chemical fumes and odors. It will service a room up to 1,000 sq ft, replacing the air every 10-15 minutes at high speed. The Portable Air Cleaner's design allows for 360 degree filtration, and its 2-speed feature offers economy at 90 watt for 400 cubic fpm and efficiency at 135 watt for 600 cubic fpm. It meets OSHA and EPA clean air standards for air improvement. Only 16.5" in diameter x 15" high, it is completely portable and can be plugged in anywhere. Its washable filter traps paper dust, press powder, and other small particles that may contaminate artwork or finished products. Weighs 30 lbs. Comes complete with filter and 340 cubic inches of charcoal replacement filter and charcoal also available separately.